Beacons with their micro-location capabilities and their ability to bring the power of Internet to everyday things have opened the doors to an endless world of opportunities. We, at MobStac, announced India’s first Beacon app Hack day for iOS developers on November 8th in Bangalore, giving developers an opportunity to get their hands on real beacons and build amazing location-enabled apps using them. The event will have iBeacon technology primer sessions, workshops and at the end of the day there are prizes worth over Rs. 20, 000 to be won! This is one event that passionate iOS developers just can’t miss – Register Now. With the Apple Pay launch complete in the U.S., Bank Innovation, a financial blog recently reported that Apple may now turn its focus towards launching a new store loyalty rewards program in time for the lucrative holiday shopping season. Check out this post to learn how Apple plans to drive both consumer and retail adoption of Apple Pay using their rewards system. With holiday shopping season just around the corner, many large retail chains are all set to leverage beacons to grant shoppers a memorable shopping experience. If you’re on the same boat and are thinking about implementing beacons in your store, follow these seven tips to make the most of your campaigns. The excitement around ambient services has faded as Highlight and others have failed to gain traction. But with beacons making precise indoor location readily available, these ambient services are now poised for a comeback. Jason E. Klein, sheds light on the hurdles that these services have to overcome to make ambient notifications a reality. Retail isn’t the only vertical where we have seen beacons in use. A number of them from malls to events have now got marketers wondering on the best way to leverage this new proximity-detection technology to engage their customers better. 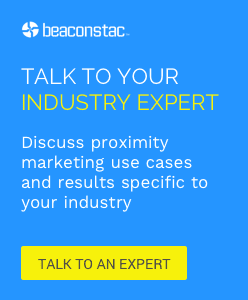 If you are one among them, then this recent ebook of ours, with a tipsheet on how to plan effective beacon marketing campaigns, is sure to set you moving in the right direction.